There may be times when you want to quickly view certain information or sort your customer base by different fields. 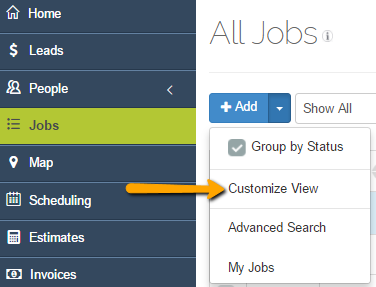 The ability to add or remove columns to your Job view is great for when you need a high-level overview of your jobs. First, navigate to your Jobs view on the left-hand side of your screen. Next, click on the drop-down arrow next to the +Add button. Then click on Customize View. 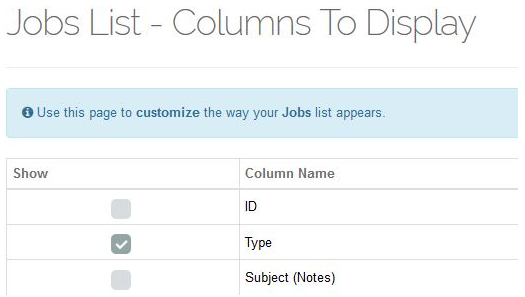 Select which columns you would like to add to your Job view. You can choose from default fields as well as the Custom Fields you've created. Once you've selected all of the fields you'd like to include, just click Save. Keep in mind that the order of these columns cannot be changed. Custom Fields will appear in alphabetical order (with special characters, numbers, and letters in that order). Click on any title with gray or blue arrows next to them to sort the list by that column in ascending or descending order. By adding columns to the Job View, you can easily access those job types that are most important to you.